Assigned to the 21st Special Tactics Squadron, Pope Army Airfield, N.C. While conducting combat operations near Camp Antonik, Afghanistan, SSgt Forrest Sibley was fatally wounded during an ambush at a vehicle checkpoint. As a result of the attack, fellow Combat Controller Capt. Matthew D. Roland was also killed. Growing up, Forrest couldn’t get enough of the outdoors and could easily get lost in his love of what nature offered; often spending his time fishing, hunting, target shooting and hiking in the woods. Living in Pensacola was one of his favorite things, and he looked forward to getting home to spend time on the beach. His love for Pensacola and unique sense of humor meant it wasn’t unusual to find Forrest decked out in typical “tourist” gear to show his unwavering love for his city. “Forrest was always smiling,” Brent Sibley, his dad, said. Forrest’s family and friends remember him for his kind-heart and zest for life. One of his prominent qualities was his ability to always put others before himself. He unwaveringly strove to support his brothers on the battlefield in spite of the ever-impending danger of the job. Forrest was full of love for his family, city and of course his team, the Florida Gators; however his service to his country couldn’t be surpassed. “Most of all, Forrest loved Combat Control, the Units, the Teams, the Training, the camaraderie, the lifestyle. All the guys from training in the pipeline to deployments – they were his brothers,” Brent said. He showed his commitment to his service and his country in every action. Forrest earned three Bronze Star Medals, one Bronze Star Medal with the Valor Device for heroism in combat and a Purple Heart for injuries sustained in combat. Even in his fourth deployment, he never wavered in his pride of being an American, and always made time for his loving family, close friends and battle buddies at home awaiting his return. “He loved his country and I am so proud to be his Dad. We were the closest of all and I miss him every second,” Brent said. SSgt Forrest Sibley was 31 years old from Pensacola, Florida. 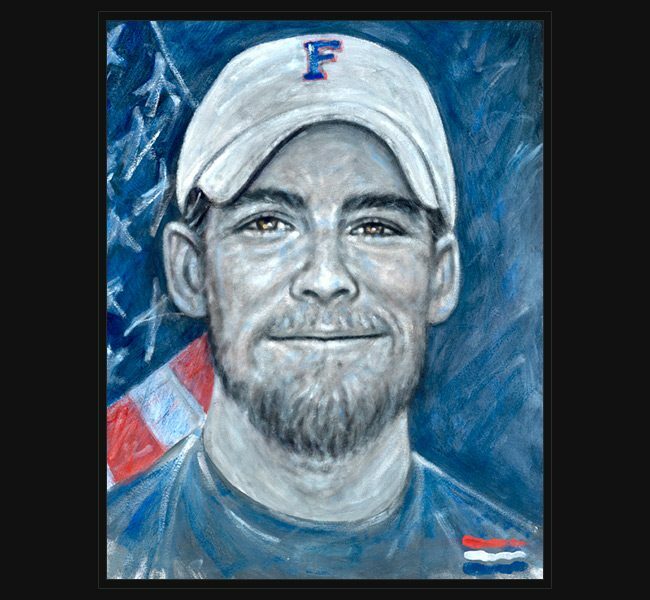 Original portrait was presented October 10, 2016 to his family during a special event held in Fort Walton Beach, Florida, hosted by The Combat Control Association.